Nothing shows our age more than our skin. When we’re young, our ability to regenerate new skin cells is a much faster, natural process. The rate in which new cells can regenerate is significantly decreased because the collagen and elastin bond together. As a result, the skin becomes less vibrant and dehydrated. So what are the overall benefits of getting a chemical peel? The benefits of chemical peels are extensive, but ‘chemical’ and ‘peel’ aren’t exactly relaxing words. The good news is that chemical peels are a lot less invasive than most people assume after hearing the name. A chemical peel is made up of ingredients found in fruits and plants such as apples, grapes and sugarcane. The acids these plants and fruits produce are naturally occurring and are capable of rejuvenating and repairing the skin. Some chemical peels can be concentrated anywhere from 10% to 70% and can be applied to the face, neck or hands. Superficial Chemical Peel– Superficial peels use a diluted liquid containing glycolic acid that doesn’t affect layers beneath the epidermis. After neutralizing the chemical reaction with water, the chemicals are then wiped off and a slight burning sensation may be present. Medium Chemical Peel– Medium peels are similar to superficial peels. However, they’re a little more painful as they reach layers beneath the epidermis. Typically, this can cause a mild burn on the skin because the chemicals are stronger. 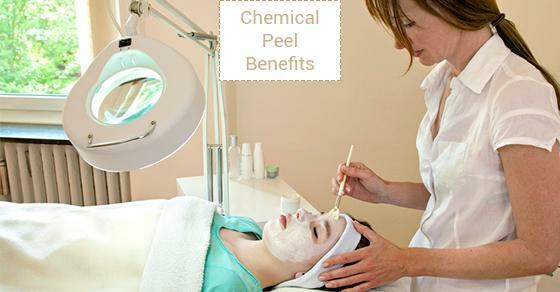 Deep Chemical Peel– Deep peels are only used on the face and cause a second degree burn after treatment. The best candidates for deep peels have a fair or light skin tone because bleach is used in the solution. The process takes longer, and is more complex than a superficial or medium peel. Think about the areas you would like to have treated and consult with a doctor. A doctor will be able to give you some insight on the procedure and determine which peel is best. It is important to prepare the skin for a chemical peel a few weeks in advance. If you have any questions regarding how the process is completed, your doctor will be happy to answer them during your consultation. Chemical peels are quick treatments that offer great results, bringing back a refreshed and rejuvenated you!